The term Ethical Monotheism is an important marker in Judaism’s tumultuous transition into the modern era. The term emerged in the context of culture-wars concerning the question of whether or not Jews could or should become emancipated citizens of modern European states. It appeared in arguments whether or not Judaism could be considered a Religion of Reason—a symbolic, motivational representation of a universal morality, and in debates about whether or not Judaism could or should reform itself into a Religion of Reason. This book is both a decisive departure from such discussions and an attempt to add a further, post-modern, statement to their ongoing development. As departure, it refuses to take for granted a philosophical conception of Religion of Reason as the standard for Ethical Monotheism according to which Judaism was to be evaluated or reformed. As continuation, the book undertakes a phenomenology of Jewish modes of ethical religiosity that allows it to inquire what kind of ethical monotheism Judaism might be. Through sophisticated analysis of select "snapshots," or "fragments of a hologram," guided by a robust theory of religion, the author discloses Judaic ethical monotheism as an ongoing wrestling with the meaning of justice. By closely examining five main "snapshots" of this long process—the Bible, rabbinic Judaism, Maimonides, The Zohar, and the modern philosophers, Buber and Levinas—the author offers his own constructive philosophy of Judaism and his own distinctive philosophy of religion. 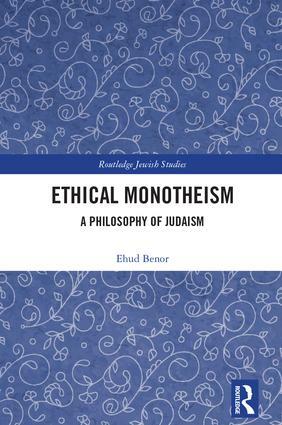 Ethical Monotheism offers a new way to think about Judaism as a religion and as a coherent philosophical debate, and demonstrates the need to integrate philosophy, history, cognitive psychology, anthropology, theology, and history of science in the study of "religion." Postscript: Can Judaism Become Archaic?